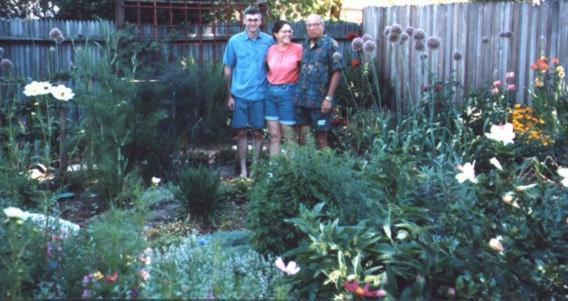 In the back yard, she had mostly lawn with a border that again featured succulents. 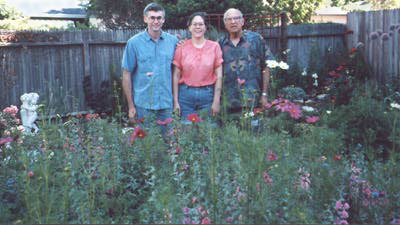 This image is the best before picture that we have, and it already is showing my and Robert's influences. This picture was taken facing roughly northwest in midMarch. In the background on the left (in our neighbor's yard) is a lovely almond tree; just to the right of the almond (in our neighbor's yard) is a white clemantis vine, and next to that is another cottonwood tree. Below the tree, there are a few succulents/cactus. In front of the shack: a fantastic yellow rose. 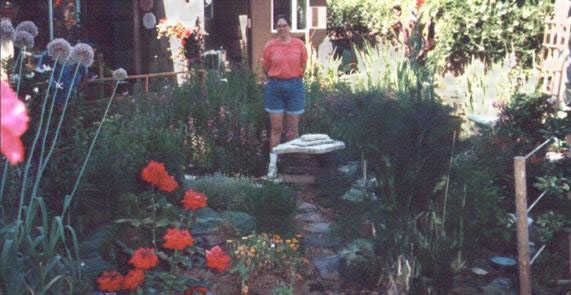 To the left of the rose: my concrete tubs that Robert moved from my parents' old house and some of my many, many pots that we moved from our previous house (a rental). 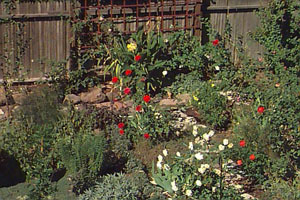 Just to the right of the yellow rose, not yet growing, is a perennial sweet pea. It has a beautiful hot pink flower, but it is very invasive. I'm trying to eradicate it from my yard. In the center of the lawn, you can see my fountain. 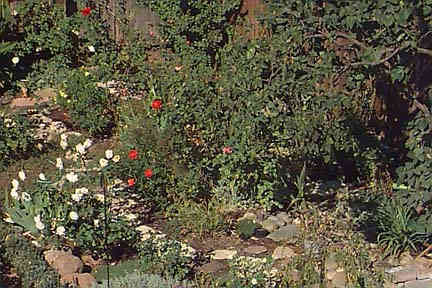 On the right (not in the picture), there was a large border with a huge white agapathus or lily of the nile, a tall red rose, some sad roses, dogwoods, feverfew, and a large orange chysanthemum. Here are some after pictures from early May. 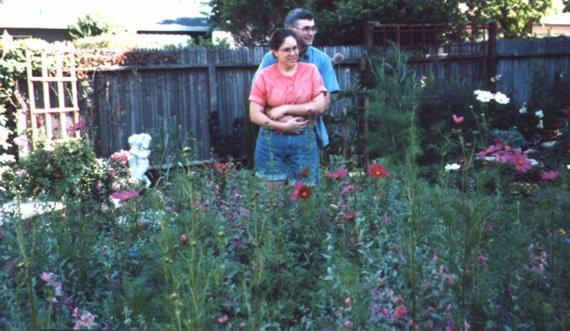 My mother took them, and she likes to feature people in her pictures, so my father, Robert and I will be blocking the view of the garden. Someday, I hope to take some nice pictures of the back without people. This is the eastern side of my garden in September. Not much is blooming besides the roses and dahlias. The white rose in the forground is (I forget), and the orange rose is Judy Garland. You can barely see the dahlias, bright - almost neon - yellow to left rear (north) of the picture. Also, a very old red rose that was in the garden when we bought hte house is blooming in the background. The white rose against the fence is a White Cascade. This bed is shaded in the morning by very large elm trees and receives full sun for the afternoon and evening. The sun is brutally hot here during the summer. My red roses get sunburned and look awful. If you live in Sunset Zone 14 and you want red roses, I recommend planting them where they are protected from the hot afternoon sun. The white roses do just fine in the hot, hot sun. The picture to the right is almost the same bed as the one above. 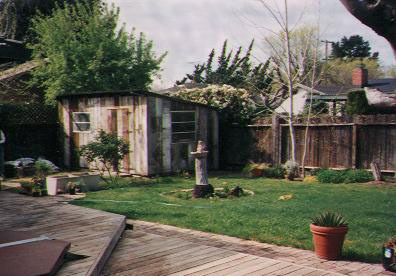 Since my yard is partially trashed right now (October 1997 putting an addition on the back), I had problems taking pictures that didn't feature the wood and tools and trash that seem to be taking over. In this photo, you can see Ingrid Bergman blooming her heart out. Even though she gets sunburned, she is my favorite red hybrid tea. She is a lovely dark red with a velvety texture. Ingrid Bergman is the red rose in the middle of the image. To the left of Ingrid Bergman, you can see the edge of my herb garden. I love herbs. They are fun and interesting to grow. Some flower, but it is the variety of texture and form and scent that really turn me on with herbs. The only caution that I have is that some herbs are very invasive and some are very poisonious. It's a good idea to educate yourself on herbs before using any but the familiar culinary herbs from your garden.